Friend Blaster Pro is a MySpace Friend Adder and MySpace Profile Automation Tool. Friend adder software is the easy way to get friends added to your MySpace profile in the shortest time possible. The Friend Blaster Pro friend adder is automated software, or adder bot program, that automates the tasks that you would normally perform manually.Friend Blaster Pro is the must have tool. ...... the tasks that you would normally perform manually. 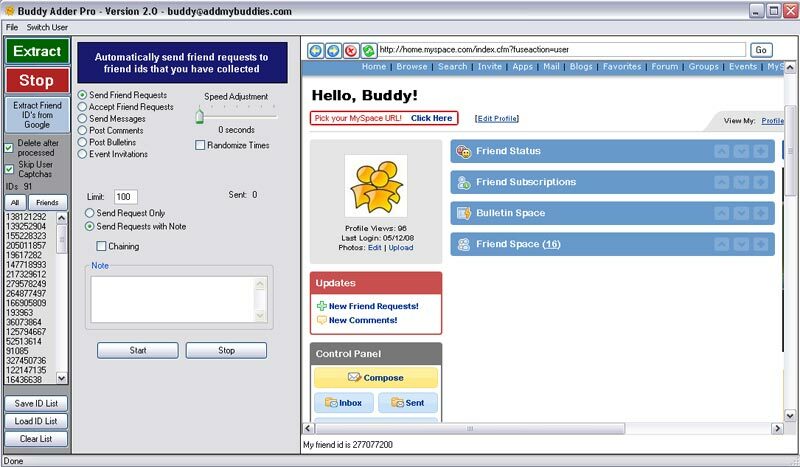 Add hundreds or even thousands of friends to your Myspace profile with Buddy Adder Pro. Automatically send Friend Requests to the demographic group you are trying to reach! Reach your specific target audience with our powerful search options. Are you looking to meet new friends or that special someone? Buddy Adder Pro allows you to locate girls and guys in your area or with your same interests on Myspace, and then send them personalized friend requests or messages, all automatically! Are you a band or performer on Myspace? Promote on the worlda�?s largest social network in the world with Buddy Adder Pro. Increase your page views & song plays by generating tons of traffic to your Myspace profile. Qweas is providing links to Buddy Adder Pro - MySpace Friend Adder 2.0.12 as a courtesy, and makes no representations regarding Buddy Adder Pro - MySpace Friend Adder or any other applications or any information related thereto. Any questions, complaints or claims regarding this application Buddy Adder Pro - MySpace Friend Adder 2.0.12 must be directed to the appropriate software vendor. You may click the publisher link of Buddy Adder Pro - MySpace Friend Adder on the top of this page to get more details about the vendor.